Before a blind date the other day, I found myself in a store that celebrates (or pillages depending on your point of view), artifacts, furniture, jewelry and the like from the continent of Asia. 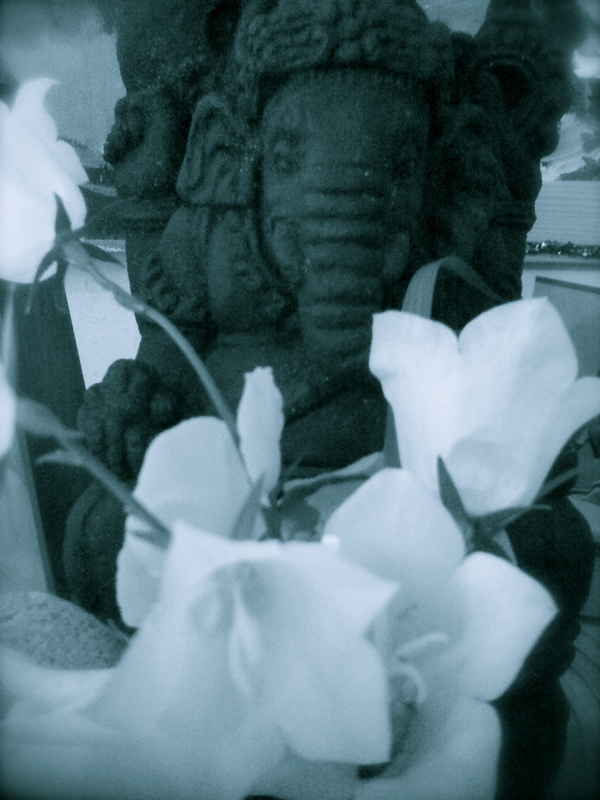 It is there where I became enamored with this particular statue of Ganesh. He is from Bangladesh, and made out of basalt which allowed for the finer details that drew me towards him. There were many others to choose from, out of wood, and stone. He was one of two hidden back in the shadows of a dark shelf, calling to me. His large heft and small size, reminded me of Sam as a baby somehow. Since I had just left family therapy where I go to talk about my family in therapy for a few sessions every few months-I was still holding the actual and emotional heft of Sam in my heart. Last year when teaching the book, Climbing the Stairs by Padma Venkatraman, I became reacquainted with my own yearning for more understanding of the Hindu religion. Although I only spent a few days reading whatever I could on the topic, it was enough to reawaken my desire to model to my own family myriad ways of practicing, or living a spiritual life. So yesterday after picking fresh flowers from our meager little urban garden, that we “offered” to Ganesh, we both identified one obstacle we’d like removed from our life. We wrote them down, and placed the miniature scrolls in the little space under his left ear, where they fit perfectly. My wish for Ganesh: Remove whatever obstacles that I place in my own way that keep me from finding a life partner; my defenses, my fears, my critical nature, my own trunk full of relational insecurities… In it’s stead, I prayed to Ganesh, bring me more readiness to open my heart. Sam’s wish for Ganesh: Remove my brother from Mom’s bed, so that I can sleep there. I’ve been meaning to read Climbing the Stairs, so thanks for the reminder! What a great story, I have been intrigued by many aspects of Hinduism for a time as well. Sam is very funny and too cute. Best wishes.